Mexico (somewhat surprisingly) only made one change to their starting selection from their last match against Germany, as Edson Alvarez started at right fullback. Carlos Salcedo moved to centre back in place of Hugo Ayala. Despite the players largely being the same, manager Juan Carlos Osorio did adjust the layout of his team for this match. Rather than use the 4-3-3 they used against Mexico or a system with three central defenders, a 4-2-3-1 was preferred instead. Carlos Vela functioned as the 10, with Miguel Layun being shifted as a right winger for this match. Herrera and Guardado functioned as a double pivot. South Korea made a couple of changes from loss against Sweden. Kim Shin-wook and Koo Ja-Cheol were replaced by Moon Seon-min and Ju Se-Jong higher up the pitch. Correspondingly, Korea was altered from a 4-3-3 in their last match to a 4-2-3-1 for this fixture. Across their back four, Kim Min-woo was chosen at left back over Park Jo-hoo. Mexico were mainly able to possess the foothold of the ball that they did in the match because South Korea was not primarily concerned with applying pressure to the centre backs. Korea rarely applied direct pressure during Mexico’s build up, causing El Tri to be able to control the tempo of the match and circulate at the speed they wanted too. Instead, South Korea dropped into a 4-4-2-0, with the forwards maintaining access to Guardado and Herrera. Typically, Son would stay higher while Lee marked the closest Mexican midfield option, with the other two midfielders behind to cover the passing options into Mexico’s central players. Towards the defensive line, man-oriented focus was applied to each of the wingers and Hernandez during attack construction. The trio applied starting positions that were quite high, moving Korea’s defensive line further back. The man-oriented focus meant that rather than letting them stay higher, they followed them to ensure one of them didn’t jump back onside before receiving a pass. This focus on coverage came at the expense of their collective compactness, creating stretched distances as they retreated further back. One of Mexico’s key mechanisms for progressing through Korea’s midfield was the feedback relationship between Carlos Vela and Javier Hernandez. As a central attacking midfielder, Vela’s role was adjusted from his customary right disposition, given the task to float and find gaps in between South Korean defenders. He mostly remained central, sliding toward the right as the ball traveled there. Vela’s movements (or lack of at times) occupied the other central midfielder in the line along with Guardado/Herrera. Vela could move slightly to the side, subsequently creating paths for Hernandez to receive the ball as he checked in. Once the centre backs found his feet, he would be mostly unopposed since Korean defenders would not want to leave their line as he went back. Hernandez could either turn, or lay the ball off to Vela and initiate the next phase of Mexico’s attack. With Korea’s man orientations in midfield, Hernandez is able to receive the ball in a large area between players, having his choice of layoff options between Vela and Layun to progress his team. Arrows show general pressing movements of Korea’s front players in the 4-4-2-0. With the central spaces covered, Korea focused their pressing efforts primarily on wide areas, where Mexico has a large strategic focus on given the individual quality of Hirving Lozano and Layun. Mexico’s attacks have also been heavily influenced by their wing play, as the dribbling out on the flanks served a critical function for their play on the break against Germany. In matches where they have more possession, the wingers are critical solutions for passing out of pressing situations that are heavily tilted to one side. Given South Korea’s wingers dropped back into midfield, they could engage in pressure once the ball was wide and have matching numbers toward the wing. Toward the left side, Hwang was a high point for Korea’s pressing efforts. When mixed with Son’s intelligent positioning in between centre backs when one of them dribbled up, Hwang’s orientation and timing with his pressure was impressive as he forced Mexico to their right, where they possessed less press resistant players than toward their left. However, these instances were not very habitual, as Mexico played out of these circumstances with more defensive possession and additional players near the centre backs. The rest of the Korean team remained in their coverage states, making the work of Hwang and Son a bit compromised as the match progressed. From South Korea’s standpoint, this game would be won or lost on the effectiveness of their transitions on both sides of the ball. Attacking wise, Son was the first target that Korea’s looked to play the ball towards. As the most dangerous player on the pitch individually, this is an unsurprising tactic. Son was most often the recipient of long balls from South Korea’s defenders when winning the ball. Some of these led to dangerous sequences where Son had to create opportunities from himself to shoot or wait for support from the oncoming midfielders. Most of these speculative long balls however were too far ahead for Son to use properly, and were collected by Mexico to regain possession and continue their control in the match. Mexico’s defense of these counter attacks was quite good, despite it being a weakness going into the tournament. Of course a numbers advantage with two centre defenders back, but Guardado and Herrera were persistent in tracking the support from Lee, Hwang, and Moon, preventing them from tacking on shots for Ochoa to deal with. Korea’s attack was not entirely heliocentric though. 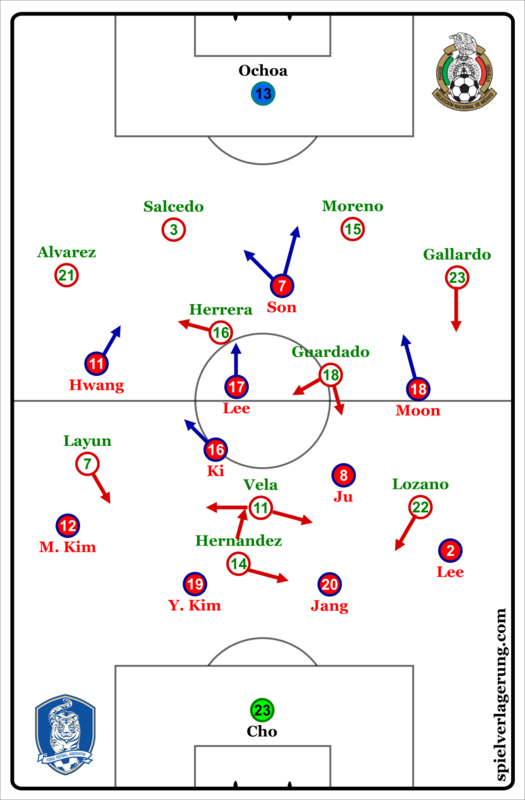 When in Mexico’s defensive half, Korea prioritized vertical passing sequences down the wings, as central players moved wide to be supporting options for third man combination sequences. Similar to what has been seen with Peru, Korea had a similar one sided wing focus in attack, having the group magnetized toward the ball to increase the number and potency of quick passes between them. These were successful throughout spells in which Mexico’s front line were late to adapt to the speed of circulation between players. This wing focus came at a cost however. Upon arriving in the final third, Korea were often short of ideas because they lacked sufficient central occupation near Son to generate quality shots on target. Most of the chances they had in the match were generated from the individual efforts of attackers. The misallocation of players away from the centre also cost them greatly when they lost the ball, as Mexico were able to target Hernandez with their first pass and break from there. South Korea’s wing focus and poor central occupation leaves them vulnerable in transition. After Lozano receives this pass, he dribbles to goal and assists Javier Hernandez for Mexico’s second goal. These Mexican counters each led to the points in the match where the game was won and lost. Goal number one originated from a counter kick where Mexico left three players up to bolster counterattacking efforts, with the passage of play ending with a penalty kick for handling the ball. The second goal came from Chicharito being able to receive freely in the centre because of the heavy wing orientation seen above. At this point, Mexico were able to kill the game as the shouts of “ole!” rang through the stadium. Son Heung-min registered an impressive curling effort in added time, but it was too little, too late for the Koreans to salvage anything. This results sees Mexico move to six points in Group F, leaving them in the driver’s seat going into their final match against Sweden. Mexico has struggled against aerially proficient teams throughout Osorio’s reign, so it will be interesting to see what tweaks Mexico makes for their last match as they enter the group. South Korea enter their final match against Germany with zero points, a tall order is required for them to advance. The tears of captain Son in the dressing room post match sum up the impending departure of the group, but stranger things have happened in football.